These powerful meditations illustrate God's readiness to help people through times of loneliness and struggle. By focusing on men and women of the Bible, Michelle illustrates how He wants people to seek His best in difficult times. From Daniel's "standing alone for God" to Thomas' times of doubting, these devotions encourage readers to find joy and comfort by spending time with God. Formerly His Love Always Finds Me. - Publisher Michelle's powerful meditations illustrate God's readiness to help people in times of loneliness and struggle. Using examples from the Bible-Daniel's standing alone for God, Thomas' time of doubting-these devotions encourage and uplift. - Publisher Prepare your heart to find the Lord in solitude. Focusing on men and women of the Bible who spent transforming moments alone with God, this refreshing devotional encourages you to seek his best during times of doubt and struggle. Heartfelt prayers and probing questions bring reassurance that nothing can separate you from the love of Christ. 320 pages, softcover from Harvest. 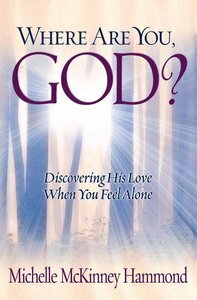 About "Where Are You, God?" Michelle's powerful meditations illustrate God's readiness to help people in times of loneliness and struggle. Using examples from the Bible-Daniel's standing alone for God, Thomas' time of doubting-these devotions encourage and uplift. Prepare your heart to find the Lord in solitude. Focusing on men and women of the Bible who spent transforming moments alone with God, this refreshing devotional encourages you to seek his best during times of doubt and struggle. Heartfelt prayers and probing questions bring reassurance that nothing can separate you from the love of Christ. 320 pages, softcover from Harvest. Michelle McKinney Hammond is a freelance writer, counselor, singer/songwriter, public speaker, and television co-host. She is known for blending a refreshing femininity with hard-hitting reality checks. She has written twenty-six books, including The DIVA Principle and the bestselling titles Sassy, Single and Satisfied and Secrets of an Irresistible Woman. You can find her Web site at www.michellehammond.com.